The Sent With Love Wedding invitation set is one that stands out from the card and it would be fair to say that this isn’t your standard wedding invitation. At first glance, the invitation is reminiscent of the artwork for the final Oasis album, Dig Out Your soul, created by Julian House from Intro. For fans of the band, this invitation will be a great way to inform their guests of the special occasion. For people who aren’t a fan of the band, the fact that very few people seen or heard the band’s last album means that you won’t get too many comments relating to it! The Sent With Love invitation is the sort of invitation that can retain a place in the home in a frame or as part of a display. The background of the card is formal with flowers taking up most of the design space but across the front of the flowers, almost daubed in paint as though stylish graffiti had been caked on a wall, is the headline information and date. The main invitation comes in the form of a postcode, with the reverse of the invitation acting as the more formal introduction and invitation to guests. The combination of both sides ensures that all of the information people need to receive is on hand but there is also a very stylish card to look at. There is a full range of stationery items available and cards for your big day, so any coupe looking to create a theme around this stylish and unique invitation will be able to do so with ease. 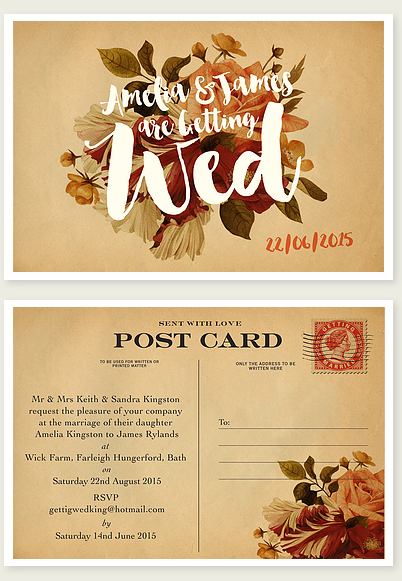 The Sent With Love wedding invitation set from The Invite Guy is not perfect for couples looking to create a traditional wedding atmosphere but for people who have a strong sense of individuality and style, this is an ideal wedding invitation collection.